Standard rectangular size rugs: 2×3, 2×4, 3×5, 4×6, 5×7, 5×8, 6×9, 7×10, 8×10, 9×12, 10×13, 10×14, 12×15, 12×18. Odd size rectangular rugs: 8×12, 8×13, 8×14, 8×15, 8×16, 9×13, 9×14, 9×15, 9×16, 9×17, 9×18, 10×15, 10×16, 10×17, 10×18, 10×19, 10×20, 11×14, 11×15, 11×16, 11×17, 11×18, 11×19, 11×20, 12×14, 12×16, 12×17, 12×19, 12×20, 12×21, 12×22. Gallery size rugs: 4×8, 4×10, 4×12, 5×10, 5×12, 6×10, 6×12. Runners: 2.6×6, 2.6×8, 2.6×10, 2.6×12, 2.6×14, 3×8, 3×10, 3×12, 3×15 and long stair runners. Carpet dealers usually carry samples of many carpet lines from multiple mills and manufacturers in their showrooms. You’ll see a range of quality when you begin your carpet search. Your best bet is to educate yourself and research your options before you head to the store. Then, you’re sure to get a quality carpet that provides comfort, durability and beauty far into the future. Below is a helpful guide to understanding what to expect when visiting a carpet dealer. How much use will the room get? This is a consideration because a heavily used room may not be the best place to install white or very light-colored carpet. Are kids going to be playing down on the floor? Or is it a formal room that doesn’t get much use? Again, lighter colors my create more maintenance but another factor the dealer is trying to consider is whether you should choose carpet made with BCF fiber like STAINMASTER® so that children playing on the floor will not find themselves covered in loose fibers shed from staple products. Smaller rooms can be made to feel larger by selecting a lighter colored carpet while larger rooms can be made to feel cozier by using a mid-to-darker colored carpet. Rooms with plenty of natural light will show the true color of the carpet while rooms on the north side of a house may need a lighter shade of carpet to keep them from feeling darker than they are. You should always remember to bring swatches of fabric from drapes and furniture, wallpaper samples, and paint chips with you when you are selecting carpet. That way you can consider a range of colors that will match your existing décor. Remember that color can also affect your mood. Warmer colors often make you feel energized while cooler tones provide a sense of calm. Are you installing this carpet for the purposes of selling the home or are you re-decorating it for your enjoyment? What is the size of the room to be carpeted? The dealer is trying to determine what style of carpet you might be interested in. A home seller is going to want to select a neutral toned carpet in a simple style, like a cut pile texture. But a home owner who is re-decorating will want to explore the many varieties available to them. Either way, STAINMASTER® carpet is a good choice. STAINMASTER® warranties are transferable to the new owner, a great selling tool, while home owners who will be living with their carpet selection will want the long-lasting durability and beauty of a STAINMASTER® carpet. Also, the dealer needs to know the approximate size of the area to be carpeted in order to give an estimate on total cost. Come prepared with a rough estimate of the size of your room and the layout. Check out our handy Carpet Calculator if you need help measuring. When you’re ready to buy, the dealer will send a professional to take the final measurements. Make sure that all cost estimates include padding, installation, seaming, stairs (if applicable), thresholds, the moving of furniture and the removal of old carpet or other flooring and materials. Always make sure that you are selecting from the highest grade carpet you can afford. With STAINMASTER® carpet, the higher the grade, the more comprehensive the STAINMASTER® warranty will be. STAINMASTER®, a name you know and trust, only guarantees the finest, first quality carpet. Because of the patented technology that goes into it, and the company that stands behind it, your STAINMASTER® carpet will provide beauty and comfort for years to come. While in the store, it may seem that many carpets look the same. But not all carpets perform the same. It’s the technology behind the carpet that makes a difference. With this patented fiber technology, STAINMASTER® carpets resist crushing, abrasive wear and color fading. The unique molecular structure of 6,6 nylon make it much more resilient than carpet fiber made from polyester, polypropylene and other types of nylon. Plus, this specially designed fiber keeps soil and stains from penetrating. This superior soil resistance technology enables SM carpet fibers to push dirt away, allowing it to be removed more easily with a vacuum cleaner. And the Stain Protection reduces the fibers ability to absorb liquids, greatly limiting its ability to become stained. This unique soil and stain protection lasts much longer than other carpets’ protection, which must be re-applied after each cleaning in order to maintain their warranties. The fibers in every STAINMASTER® carpet contain a special carbon compound that act like thousands of tiny lighting rods, deflecting static shock for the life of the carpet. Most other carpets are sprayed with anti-static protection that can wear off with foot traffic and successive cleanings. Why is anti-stat protection important? With our homes filled with expensive electronics these days, the last thing you want is to short circuit a computer or audio system simply by walking on your carpet and touching a device. Anti-stat protection offers peace of mind for homeowners where their electronic investments are concerned. At the store, you’ll see lots of labels from different mills and manufacturers. You might get confused as to what type of carpet you are looking at. Look for the STAINMASTER® label on the back of the dealer’s sample. That’s the only way to guarantee a carpet that features STAINMASTER®’s comprehensive warranties, anti-static controls, resilient fibers and a carpet surface that actually repels dirt and soil. I bought my first Oriental carpet five years ago at a small shop called Pasha’s Carpet Gallery off Taksim Square in Istanbul. The name alone, emblazoned in English, should have tipped me off. But dazzled by the beauty and feel of the thick wool pile, I laid out two or three hundred dollars more than I should have and lugged my purchase, a wool Hereke of indifferent quality, home in a bulky vinyl bag. I learned the hard way: buying carpets can be a tricky business for the uninitiated. The best merchants are hypnotic, softly running their fingernails over the back of a rug to demonstrate the tightness of the weave, and explaining in patient detail the history and design spread out in an array of colors and patterns on the floor. As attendants rhythmically flop one rug on top of another, to the soft clink of spoons swirling sugar around demitasse cups of coffee, one is lulled into the somnolence that can often end with parting from huge sums of cash. Istanbul is one of the most delightful places to look for carpets. There are more shops crammed into the alleys and recesses of the city than anywhere else in the Orient. The range of choice, from new Turkish Herekes or Kayseris, to stacks of old Persian and Turkoman carpets carted in from Iran and the old Soviet Union, is unrivaled. And the city, perched on the Bosporus, is built around the majestic monumental edifices of the Ottoman Empire and finest hotels in the Muslim world. The serious collector of great, and often astronomically expensive, antique carpets can find what he or she wants in the city. But the purchase of carpets as an investment, unless one has years of experience, is generally a mistake. The value of antique pieces is determined by a market where there are no firm rules. A carpet that appears threadbare and drab to the uninitiated can be worth thousands of dollars to the collector. Prices vary enormously, but bargains, especially in Turkoman and Persian carpets brought in by visitors from the former Soviet Union and Iran, abound in the recesses of the sprawling covered Grand Bazaar. No standard measurements, exact to the last inch, exist in the case of carpets; the most common size available is the medium size, about 6 feet 9 inches by 4 feet. A good Turkoman or Persian of this size can be found now in Istanbul for $800 or $900, a few hundred dollars less than in London or New York. There are hundreds of carpet shops, and numerous hole-in-the-wall stores that surround the mosques and palaces. The covered bazaar has dozens of tiny establishments and there are some more upscale shops on Cagaloglu Street, just outside the bazaar. But quality and age cost money (although paying a high price is not necessarily a guarantee of a superior rug). Dirt cheap prices, however, usually indicate inferior work, spelling disaster in a few years as colors fade unevenly and the weave unravels or twists out of shape. Turkish Hereke wool carpets, handmade with intricate floral designs, are one of the best buys in the Middle East, especially if you seek durability. Turkey has 14 basic designs, usually determined by the region where the carpet is produced. There are Canakkale-Ezine, for those who like geometric designs and bright colors. The Milas carpets, also with geometric designs, have more muted colors of pale yellow, tobacco and reddish brown. Cotton is used in the base of most of these wool pieces, which makes the rug much more stable and reliable. The Turkish Ministry of Tourism and Culture runs a wonderful store in a restored 16th-century Turkish bath. Here weavers reproduce 400 handmade copies of some of the most famous Turkish designs and, with the exception of blue and green, use natural dyes. Prices, fixed at about $125 a square meter, are very reasonable. But the quality of the weaves differs tremendously. Still, for modern copies, the airy bath, with its marble floors and domed roofs, houses one of the good deals of Istanbul. Once you venture out of the old bath, prices are usually determined over sweetened tea or coffee. Even in the best shops, be prepared to bargain. And don’t let the effusive hospitality of the rug dealers make you feel obligated; it is all part of the game. The Herekes, my favorite Turkish design, are available in many shops, such as those that run up and down Cagaloglu Street. And because there are a few basic patterns it is easy to compare prices by asking the cost per square centimeter. The density of knots can be a good way to calculate price, although it alone cannot determine a carpet’s quality. The kind of wool, pattern and dyes also must be taken into account. HERE I was, waving my white card, bidding on Lot 2, ”a fine antique kaskai carpet from southwest Persia,” and competing with a bank of 10 telephones and a back wall lined with Iranian rug dealers. This was my chance to beat the mercilessly high prices of the New York market and fly home with a cargo hold of impressive room-size antique and not-so-antique carpets in rich Turkey reds, ochers and indigos. Soon to be the co-owner of an 1872 brownstone, I flew to London to bid on Oriental carpets — as many as I could buy with $10,000 of borrowed money. From the printed estimates published in catalogs and the full-color pictures of each rug, it was evident that London was the place to go for a bargain. Estimates were much lower than I was used to in New York and Connecticut auction rooms, even after factoring in a $468 airfare, hotel charges, shipping and other fees. Of the 68 rugs pictured for the April 10 sale at Christie’s South Kensington gallery, I liked at least a dozen. I imagined I could drop by the gallery on auction day, wave my white card a few times and come home with carpets and a few dollars left in my checkbook. In the weeks before the sale, I did some homework. The directors of the carpet departments of New York’s biggest auction houses told me that market forces might be on my side in London, especially for the less valuable semiantique rugs I was looking for — authentic hand-knotted rugs that would not lose their value, but were in less demand across the Atlantic. The London auctioneers said that an increasing number of their clients were Americans, flocking there for the lower prices — both privates (British slang for retail customers like me) and interior designers. Aaron Nejad, a London-based carpet dealer, estimated that rugs could be bought for 30 to 40 percent less than in New York. Elisabeth Poole, head of Christie’s rug department in New York, estimated the saving on certain rugs at 10 to 20 percent. ”Yes, rugs at auction are definitely cheaper over here,” said Mark Dance, head of carpets at Bonham’s Auction Gallery on New Bond Street. I picked out my favorites: an antique mahal from western Persia, 8 by 11 feet, with a Turkey red background and a pattern of angular vines and rosettes, estimated to bring $2,025 to $2,600, and an 11-by-18-foot gem, full of rich reds and greens, billed as a ”fine modern carpet in the Arts and Crafts design,” estimated at $3,600 to $5,000 (perfect for my 15-by-22-foot library). I also took orders from friends — orders that were, alas, not to be filled. The experts had warned me that buying rugs at auction was tricky business for a novice, even one who spends weekends haunting country auctions. I decided to find an adviser to join me at the London auction house to inspect the rugs before the sale. I was looking for decorative rugs for my house, but I also wanted to be sure my investments would hold their value. But age does not seem to affect price in the so-called midmarket (between $1,000 and $8,000). It was not the number of knots either. Or the condition. In today’s decorator (versus collector) rug market, it’s the color that counts. Pale Oriental rugs are in vogue right now, especially in America. ”That rug has New York written all over it,” one dealer said, gazing at a modern northwestern Iranian carpet. The rug looked old, a rich dark beige, almost gold, in the catalog. Up close, it looked bleached out — and it was, said several dealers, who speculated that it had been lightened for the American market. At this sale, the catalog’s colors were the biggest problem. They were off — way off. Mr. Lampé had warned me on the phone that the photographs were too dark. But when I arrived at the exhibition, most of the rugs looked faded and newer than in their pictures. ”That rug dates from tomorrow,” one dealer said, kicking the corner over a gold rug with his foot, which dealers do to check the knot structure (and, I suspect, to intimidate the less knowledgeable). My favorite rug, the Arts and Crafts, did not have William Morris’s hunter greens and mellow reds. It had Morris Lapidus colors, a bubble-gum pink and a lime green more conducive to a Miami beach house. That was my rug-buying adventure: loved the photograph, hated the rug. Nevertheless, there were bargains to be had among the disappointments. The best deals were in dark rugs or classic Orientals with center medallions, because they are out of fashion. A 14-by-20 foot Bakhtiari, made in western Persia probably about 50 years ago, was estimated at $3,620 to $5,065. At that price, Mr. Shaffer said, it was ”cheaper than chips.” In good condition but with a black background, it sold for $3,186, plus premium. An antique Ziegler — a late-19th-century 8-by-12, an allover pattern (no medallion) — was another deal. Estimated at $4,345 to $7,240, it went near the low end at $5,069. So why didn’t I buy that rug? It seemed dull, though maybe washing would fix it. But of all the rugs I viewed up close, I really loved only one. The kaskai that inspired me to jump into the bidding was charming — a tribal rug with animals, trees and palmettes. Nevertheless, it had a 3-by-3-inch repair in the middle, which meant I would either have to stare at it for the rest of my life or find the right craftsman to restore it. And it was not the right size for me: I was trying to fill nine big rooms. This was only 4 by 8 feet. And then there was the price. Estimated at $860 to $1,300, it sold for closer to $3,200 (way over my limit of $1,100). ”You picked a collector’s rug — not a decorative rug,” said William Robinson, the international director of rugs and Islamic art at Christie’s, who conducted his own, higher-priced-carpet sale on April 25 at the house’s King Street galleries. By auction’s end, I had bid on three other rugs besides the kaskai, mostly because I had come so far. In each case, I dropped out when the bidding advanced beyond the ridiculously low limits I had set for myself. I knew I could live without them. But the kaskai: I still mourn for it. I went to London and fell in love with the wrong rug. WHEN Americans buy rugs at auction abroad, the so-called hammer price — the winning bid, by telephone or hand-waving — is only part of the cost. Besides the customary buyer’s premium, which adds 15 to 20 percent, there may be customs duties. If the seller classifies the rug as antique, meaning 100 years old or more, the United States does not charge customs fees, but if it is newer, 4.6 percent will be assessed. Americans buying in London may also have to pay the VAT (value added tax), but it is generally refundable. Large international auction houses like Christie’s or Sotheby’s will arrange for a refund. Still not daunted? The major carpet auctions take place in spring and fall. For bargains, aim for the off-season. Christie’s South Kensington will offer carpets on June 12; Bonham’s New Bond Street on July 9. Auction house Web sites will give other sales. You may also ask to speak to a carpet expert on the staff, who can point out repairs and tell you whether the rug has been bleached, cut down, tinted with felt-tip pens or otherwise ”improved.” If you bring a dealer to advise you, make it clear you will not buy a rug from him, no matter how much he runs down the carpets at the exhibition. Finally, buy for love, not for investment. HOMEOWNERS often find selecting a carpet to be difficult. There are so many styles to choose from and the descriptions are often obscure and ill-defined. Indeed, many carpet manufacturers add to the confusion by using the same or similar terms in a variety of ways. Woven or tufted carpet, face weight, S.P.I., pile, secondary backing, heat set, plush and shag are just a few of the terms that a carpet buyer will encounter. In order to understand some of these terms, it is helpful to know how carpets are made. Traditional carpets are essentially woven textiles, and as such, they are made up of a series of threads or cords that run the length of the carpet. These are called the warp. Other threads, called the weft, pass under and over at right angles to the warp threads. Carpets made of just the warp and weft are called flat weaves or kilims (this term is commonly applied to tribal and Oriental carpets, but not exclusively). In addition to warp and weft, most carpets have other threads tied into the weave. These are called the pile, and they are woven so that they stand up from the foundation. The pile is the part of the carpet that you walk on. Woven carpets must be cut in line with the warp and weft and they must have a binding along the edges to keep the threads from unraveling. Woven carpets are the oldest types of carpet. Another type of carpet is tufted. Tufted carpets look like woven carpets, but their construction is quite different. They have a ready-made back and the pile is inserted into it. The pile is locked in place with a coating of latex, and then a secondary back is applied for added strength. 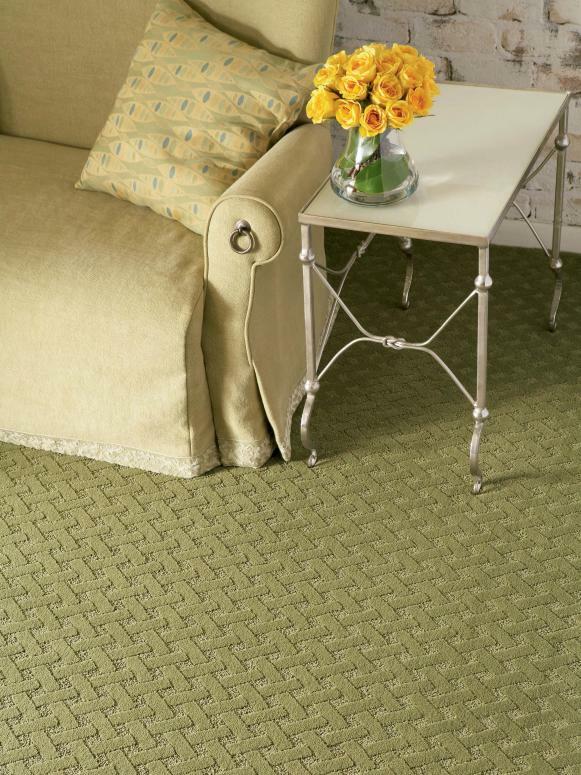 Tufted carpets can be cut in any direction, and they do not need binding along the edges. The tufting process allows manufacturers to make carpets faster and with a greater variety of textures than with weaving. In general, tufted carpets are less expensive than woven ones, but they are not as durable. Many of the terms used to describe carpets have to do with the profile of the pile. Level-loop carpets have a pile made of loops of equal size and height. These carpets wear well, are easy to clean and are good for high-traffic areas like hallways and family rooms. Trimming the tops of the loops on those carpets makes cut-pile carpets. This creates a plush pile with a velvet texture. Cut-pile carpets are not as durable as loop carpets, so they should be installed in low-traffic areas like the living room or bedroom. Cut-and-loop carpets have a pile of loops and cut loops. This combination creates a carpet with an uneven textured surface that is durable but is harder to clean than the level loop or cut loop carpet. A Saxony pile is similar to cut pile with one important difference: the pile fibers are twisted then heat set. Heat setting bakes the twist into the fibers and makes them more resistent to matting, fuzzing and denting. Thus a Saxony carpet is able to retain its plush, velvety texture longer than an ordinary cut-pile carpet. Berber carpets have tightly spaced loops of thick yarn. These carpets have a dense textured surface that is very durable, but the loops readily capture dirt and they are hard to clean. Finally, there are the terms plush and shag. A plush carpet has a dense, deep pile. A shag carpet has loops so long they flop over. Shag carpets have an interesting texture, but they trap dirt and are difficult to clean. Other carpet terms are used to describe the density of the pile. Face weight, for example, indicates the weight per square yard of the carpet’s pile. A heavy face weight of, say, 48 ounces indicates a plush carpet with extra yarn that will be resilient and long-wearing. Similar to this is carpet density, measured in stitches per inch (S.P.I.). This number tells how much yarn has been put into the face of the carpet. Generally, a higher number signifies more loops and indicates better quality. Comparing carpets by S.P.I. figures can be misleading if the carpets have different pile configurations. For example a good cut-pile carpet may have 10 to 12 S.P.I., while a similar quality Berber with thick yarn loops may have only 5 to 6 S.P.I. One simple way to judge the quality of a carpet is to fold it back slightly (pile side up). The better carpet will reveal less backing. In addition to buying a carpet, the homeowner is also faced with the problem of selecting a carpet pad and having both installed correctly. These topics will be featured next week. THE greatest challenge the average shopper with a living room will face in a lifetime can be summed up in two words: rug merchant. On one hand, the phrase conjures images of tall stacks of grand Persian Sultanabads, intricately woven Kermans and luxurious antique Tabrizes, all accompanied by mysterious pedigrees and hardy rug assistants who seem only too happy to unroll them for inspection. But ”rug merchant” also invokes nerve-racking images of shop windows that proclaim: ”Going Out of Business.” Anytime I see a rug store with a banner that says ”Eighty Percent Off — One Day Only,” I’d rather try to find a bargain in a Times Square electronics store. So for years I took the easy way out. I bought shoes. Then one day last week I had an epiphany of Joycean proportions. I suddenly saw the living room for what it was, a loveseat adrift on a scrap of fabric roughly the size of a face cloth. I called that a rug? I could have ignored this crisis. I could have walked past the face cloth to go pay the bills from last month’s credit card purchases. Instead, I immediately drove over to the local rug store, armed with nothing more than the vague goal of making my living room look like one of those glossy shelter magazine pictures that feature the muffled elegance of an age-mellowed Oushak. An hour later, I came out shaken. Prices for room-size rugs ranged from $4,500 to $46,000, and I had no idea why. And what was an Oushak, anyway? Still, I took home three rugs on approval — one good test of whether a rug store is reputable is whether you can try out a carpet at home without having to purchase it first — and all of them looked good. I only wished I knew why or whether they were worth more than the similarly sized hand-knotted New Zealand wool rug I’d seen for $1,300 at potterybarn.com. They were prettier, but what was that worth? If not for the Internet, I would still be floundering. Luckily, I quickly found a number of rug information sites, the best among them being the amazingly detailed spongobongo.com, where a longtime rug collector, Barry O’Connell, has meticulously amassed information about every kind of rug imaginable that is native to the Middle East or Far East. So I phoned Mr. O’Connell, the associate editor of the online journal Oriental Rug Review (www.rugreview.com) to ask him how to evaluate the rugs in my living room, which included one made in Pakistan that I was really starting to like. ”First, use the online sites to do some research,” he said. ”See which kinds of rugs you like and which rugs you can afford. Then you buy from a reputable dealer who does not have ‘Going Out of Business’ sales every week.” From Mr. O’Connell’s ”Trusted Resources” list, I found dealers who sell online, like cyberrugs.com (which specializes in Art Deco rugs), internetrugs.com (which has a large selection of high-quality new rugs) and c-innercircle.com (which specializes in new and antique authentic Persian and Iranian rugs). At another site, called Antique Rugs Studio, I found a list of high-end dealers who sell antique rugs (www.antique-rugs-studio.com/antique–dealers–links.htm), which were generally made no later than the early 1900’s, before synthetic dyes were widely used. I got carried away clicking on little digital images of beautiful rugs at sites like http://www.moheban.com, http://www.pasargadcarpets.com and markarianantiquerugs.com. By then I knew that the Hereke carpet hailed from the north shore of Izmit Bay in Turkey, the Oushak from northwest Turkey, and that both were too far expensive for me. Now descriptions like machine-made (a category that includes rugs from manufacturers like karastan.com and couristan.com), hand-tufted (pile carpets made with a gun-tufting tool), handwoven (hand-loomed flat weaves like kilims) and hand-knotted (what we traditionally think of when we hear the phrase ”Oriental rug”) made sense. I also learned that the best rugs are wool, use vegetable dyes and have denser concentrations of knots than lesser rugs. Prices for room-size rugs can range from $50 for a machine-made synthetic to hundreds of thousands of dollars for a hand-knotted antique in excellent shape. So what about the three rugs, one of which I now knew I loved with all my heart, that I had brought home? Translation: the Pakistani rug I loved probably would not hold its value. For rugs like those, the way to compare prices is by the cost per square foot. The highest-priced new rugs in that category can cost from than $50 to $100 per square foot; the rugs I had on approval cost roughly $75 per square foot. Had the rug betrayed my love? Among the best buys in new rugs, Mr. O’Connell said, are Iranian rugs that have become widely available since 2000, when the United States government lifted a 13-year embargo against importation. So should I break up with my current rug in favor of a new Iranian or a semi-antique Persian rug? I took the rugs back to the store. But having learned so much online, I wasn’t going to give up now. I brought home a semi-antique Heriz from another store. My behavior was typical of shoppers who do online research. Dealers say that while few buyers actually purchase rugs from their sites without touching or seeing them, many come into a store armed with information from the Internet that makes their search more specific. But I took the Heriz back, too. Then I went back to the first store and brought home the rug I loved. It still loved me back. I haven’t made up my mind. But I must say this has turned out to be much more fun than paying last month’s bills. Yalameh Carpets are produced in the town of Yalameh, which is located North of Isfahan city in central Iran. They are composed of wool on cotton warps and wefts using the Persian knot. Typically, these rugs feature a highly characteristic design: multiple hooked diamond medallions with spandrels and geometric borders. The color scheme generally contrasts blue with an orange/light brown/tan field, with a background of ivory or cream in the field. Most of these rugs are mid-sized (4’x6′,7’x10′) or smaller, with some exceptions. Yalamehs are among the finest quality tribal rugs produced today. The Yalameh are a group of nomad tribes living in south-central Iran, between the mountains and Bakhtiari province of Kerman. Yalameh are the descendants of the Turko-Persian northwestern Iran that were forced south in large waves in the fifteenth – seventeenth century. Some of the sub-tribes have gone even further south to reach areas near the Persian Gulf, but their Turkish descent is evident in their colorful, geometric rugs. The Yalameh rugs have very warm and magical designs, with colors as the mature terra cotta, the taupe and navy blue. Most of the carpets produced by nomads Yalameh are produced within the ancient city of Shiraz. Good Shiraz rugs are similar, but the carpets outside the city are often of better quality, the opposite of what one would expect.The Yalameh are a group of nomad tribes living in south-central Iran, between the mountains and Bakhtiari province of Kerman. Yalameh are the descendants of the Turko-Persian northwestern Iran that were forced south in large waves in the fifteenth – seventeenth century. Some of the sub-tribes have gone even further south to reach areas near the Persian Gulf, but their Turkish descent is evident in their colorful, geometric rugs. The Yalameh rugs have very warm and magical designs, with colors as the mature terra cotta, the taupe and navy blue. Most of the carpets produced by nomads Yalameh are produced within the ancient city of Shiraz. Good Shiraz rugs are similar, but the carpets outside the city are often of better quality, the opposite of what one would expect.History & ConstructionFrom the great southern province of Fars, through parts of the province of Kerman, nomadic tribes have a long history of rug weaving. Afshar, Qashqa’i, Gabbeh and other tribal rugs are produced in the southern part of this vast area. The Afshar tribes are mostly in Kerman province, while the renowned Qashqai tribes are spread across both provinces and other areas of southern Iran. Some centers include ditessitura important historical city of Shiraz in Fars, the famous city of Kerman, and the city of Abadeh of Sirjan and many other groups of nomads and village.Strong Turkish and Kurdish influences and techniques of weaving are visible, particularly in the use of turkish knot symmetrical fabric up to a density of 100 knots per sq.. inside. The foundation and strong and durable cotton, or hair more naive cases, wool or goat. The wool pile and very bright and fine and that was shorn from local herds, and colored mainly with natural dyes and root vegetables. These simple, gentle weavers are naturally fond of bright, lively colors for their primitive locations. Naive produce carpets that are unique treasures and may take many months to complete. Oriental rugs always sell better on Sunday than any other day of the week. At least that is the experience of importers and retailers who have been at it for as long as 12 years and even managed to hold sales in some cities and states where blue laws bar store openings on the Sabbath. Now that New York’s blue law has been set aside, Sunday rug sales are expected to increase. “Sunday is a big ticket day for us” said William Jackey, general merchandise manager of W. & J. Sloane. During the last four years, Sunday rug sales sponsored by Sloane’s have been held in hotels and at the Fifth Avenue store. Sloane’s Sunday event, held last weekend at the Statler Hilton hotel, was the only one of six this year scheduled away from the store. Some $4 million worth of exotic rugs priced to sell from $500 to $10,000 were stacked like pancakes, wall to wall on the ballroom floor. Actually Sloane’s had resisted Sunday rug sales for years before taking the plunge in 1973. By then rug shoppers were already in the habit of making the rounds of the New York hotels where Sunday sales had been going on since 1964. “It was those hotel auctions that forced us into it,” Mr. Jackey conceded. The store sales proved so successful—grossing “well into six figures each time”—that the store increased the number of such events from four to six a year and the practice spread to its Atlanta and Philadelphia (Jenkintown) stores, too. The auction phenomenon occurred in a period of surging sales in which imports of handknotted weavings from Iran (the largest producer), India, Pakistan and Turkey skyrocketed. The total value of such imports rose from $9 million in 1964 to $16 million in 1971 and $32 in 1975, according to the latest United States Bureau of Census figures. And although prices rose in that period, rug imports did too—climbing from 5 million square feet in 1964 to 10.4 million square feet last year. At conventional auctions where the mystique of period orientals continues, a record was set recently in sharp bidding at Sotheby Parke Bernet in London. The 16th century north Persian shrub carpet that was knocked down for $115,630 eclipsed the old mark of $112,500 paid in 1928 at Christie’s by Duveen, the late art dealer. The person most responsible for the auctionitis that still grips the oriental rug market is Nader Ghermezian of the Iranian Brotherhood of Rugweavers Inc. who holds forth most Sundays at the Waldorf Astoria hotel mesmerizing audiences of up to 800 with his glib chatter and entertaining chant. The rugs he sells range from $5 to $26,000 with the bulk of them in the $300 to $2,000 category. Mr. Ghermezlan’s auction career dates back to 1961 when he began public sales of orientals in Toronto. By 1964 he was auctioning here. What began as an occasional event now represents about 40 auctions a year in New York alone. FOR anyone who has ever wanted an old Persian rug to warm up a favorite room, now may be the time to snag one. Thousands of old Oriental carpets will be on sale at reduced prices this month, many in the softer palette favored by designers this year. Sales will take place both downtown and uptown in Manhattan, with antique carpets that used to sell for $20,000 going for $10,000 or less. Prices, she added, are returning to ”normal” after years of inflation. ”In the 90’s, nothing was real,” she said. Graham Head, president of the rug division at ABC Carpet & Home, concurs. ”The days of Mrs. So-and-So coming into ABC and impulsively buying a $20,000 rug are over,” he said. ”The economy has finally forced prices to become realistic.” Furthermore, he declared, rug prices are often determined by decorative value, except at the high end, where factors like age and quality come into play. Many of the ABC suppliers, clustered in the area between Union Square and 34th Street, came to New York from Iran in the 1970’s, bringing out their fortunes in rugs. They say that after a 25-year boom they are being squeezed by the shrinking market for old rugs, a victim of the recession not only in the United States but also in Europe, where many old rugs are bought from sources in the United States. The old-rug business has also been hurt by a trend toward modernist interiors and by the advent of high-quality new rugs produced using traditional weaving techniques, handspun wools and vegetable dyes. Mr. Soumekh, who is supplying rugs to the ABC sale, will offer an early-20th-century Serapi, 10 by 15 feet, for $12,500; previously, he said, it was $25,000. His inventory also includes Kerman, Mahal, Tabriz and Heriz styles from the first half of the 20th century. ABC’s staff will assist customers, and the store will earn a commission on each sale. The two dealers maintain that there is still a strong market for high-end rugs (over $50,000) but that they have a glut in the ”midrange” (up to $30,000). Periodic ”tent sales” at Bloomingdale’s are also contributing to the downward pressure on prices. The store is advertising ”thousands of handmade rugs” this month at discounts of 50 to 70 percent. Many rug wholesalers operate in the style of an old-fashioned Mideastern carpet business, where prices are flexible. ”Stack your rugs to the roof and let the customer choose,” said Leslie Stroh, the editor of Rug News. At one showroom last week, a wholesaler sat alone amid carpets piled to the ceiling, with a humming tea kettle waiting to be pressed into service. The desire to clean house reflects cultural changes as well. Owners of family businesses founded generations ago say their children, raised in the United States, are interested in other things. ”I’m not a business-oriented person,” said Mr. Soumekh’s son Amir, 21. A senior at Columbia, Amir plans to attend the Mount Sinai School of Medicine in the fall. The Internet has modernized some aspects of the carpet business, especially among customers who like to use it for research. But selling expensive rugs is still largely an in-store experience. ”We make very few sales over $2,000 on the Web,” said Mr. Head of ABC, which sends digital images of rugs by e-mail to customers who like to get an idea of the selection. Internet aside, for many people, buying an antique Oriental carpet remains daunting, partly because it is difficult to judge claims, whether they involve the rug’s quality, value or history. Dealers clearly hope that by slashing prices they can stimulate a gambling spirit among those who have longed for a handwoven rug from another time and place and have simply been waiting for the right price. TAKE a look down there, below your feet. There’s your Oriental carpet, finely woven, perhaps 100 years old. It may be a treasured heirloom, or a valuable purchase worth tens, or even hundreds of thousands of dollars. Yet you lay it on the floor and walk on it day in and day out. The children spill juice on it, the dog has accidents on it and the cats claw it when nobody is around. Hand washing involves full immersion, wetting and shampooing both sides of the carpet (”You can’t wash only the front,” he said. ”That just moves the dirt around.”) and washing fringes separately so they won’t turn gray. Because carpets require lots of water and become quite heavy when wet, and because dyes can bleed, Mr. Paoletti favors professional cleaning. ”Do-it-yourself rug washing can be a minefield,” he said. Some cleaners charge a pick-up and delivery fee, including moving furniture, and others charge an unrolling fee, which can add up to an additional $30 or $40. ”If you’re being charged 50 or 60 cents a square foot, it’s not being washed by hand,” Ms. Lombardi said. While Ms. Lombardi said that a handmade Oriental carpet is ”pretty indestructible,” all the experts had suggestions for keeping them in prime condition. The No. 1 way to keep your rugs cleaner, Mr. Paoletti said, is to remove shoes before walking on it. All the experts said that proper padding is essential to prevent skidding and reduce wear. Mr. Paoletti suggested vacuuming both sides of the rug as often as possible, vacuuming in the direction of the pile. Ms. Lombardi recommends turning the entire rug upside down once a year, vacuuming the back, and then leaving it for a few days so the dust will fall out.